Soon after I took over this K-3 school, a first-grade boy "stabbed" another child with a pencil during an indoor recess. That event, which almost spurred parents to file charges with police authorities, drew my attention to the need to revisit our plans for recess on inclement days. I am the principal of a K-3 school. When I took over the school, the indoor recess situation comprised two teachers patrolling the halls while two teacher aides monitored the class during a half-hour of free play. It was during one such recess that a first-grade boy "stabbed" another child with a pencil because he wanted to play with the blocks with which that boy was playing. The incident was reported to the police, and the parents of the "victim" came very close to pressing assault charges. The parents of the other children in the class were up in arms too; they wanted something to be done to protect their children from this bully. As a result, one boy was transferred into another class and an aide was hired to give one-on-one supervision to the perpetrator. I ordered age-appropriate board games for the classes. (Many children do not get to play "Candyland" or "Chutes and Ladders" at home -- but now they do!) I also ordered a series of character education videos to complement our character ed program. This summer, I picked up National Geographic DVDs at a conference. We also talked about ideas for quiet relays and "quick" craft activities. And we purchased dance videos to add an exercise component to this scheduled playtime; I have even joined the classes in doing the "chicken dance" and the "electric slide." When weather forces an indoor recess after lunch, I announce the activity that each class will be assigned for that day's indoor recess day. We vary the activities, and the children always look forward to hearing what their activity will be. Our indoor-recess plan has been very successful in filling free time with productive activities. 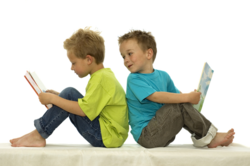 There is always the option for quiet reading time if the child does not wish to participate in a board game or art activity. I have received many thank you's from the students for making indoor recess time fun. More important, though, indoor-recess discipline issues are non-existent. Initiating these activities has also proven a good deterrent for the occasional child who might need to spend recess time in my office -- he or she definitely misses out on some fun. This indoor recess plan even spawned a "Connect Four" tournament in the third grade. Note: The child who "stabbed" another with a pencil was transferred the following September to another school in the district to give him a fresh start. See our How I Handled... Archive to read about problems that other principals have solved. The How I Handled... series is intended to be practical resource for all principals and principals-to-be. Each week, members of Education World's How I Handled team share how they solved actual problems relating to school leadership, parent involvement, professional development, and a host of other "principal" responsibilities. How I Handled team members are anonymous; in that way, they can share freely the range of issues/problems they are called on to solve each day.